Throughout the Oak Hammock Marsh Interpretative Centre in Manitoba, Canada there are over 30 kilometers of trails, this one with a view of the wetlands of the Teal Cell. From this lookout point along the trails at the Oak Hammock Marsh Interpretative Centre in Manitoba, Canada, one can admire the beauty of the Teal Cell. 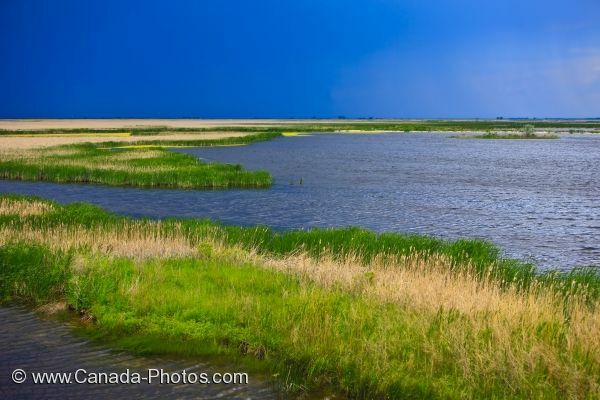 Numerous trails make their way around the Teal Cell, some being called Wren, Teal, Killdeer and Muskrat where the wetlands have become protected by the Government of Manitoba and Ducks Unlimited Canada. Guided hikes are available with an interpreter who can explain the daily life at the Teal Cell or one can hike the trails on their own. Teal Cell and Coot Cell are the larger areas of water which need exploring at the Oak Hammock Marsh, with smaller ponds and lakes in the region also providing a home for the wildlife. While hiking alongside the Teal Cell, please abide by the rules in the wetlands such as only taking pictures, leaving only footprints and being aware of any nesting areas. There are 25 species of mammals, 300 species of birds, amphibians, reptiles and fish which all use these wetlands as their home with a long history needing to remain intact. Picture of the Teal Cell at the Oak Hammock Marsh Interpretative Centre near Stonewall in Manitoba, Canada. Overview of the Teal Cell at Oak Hammock Marsh Interpretive Centre, near Stonewall, Manitoba, Canada.